Most people enjoy a little solitude. Spending a lot of time alone, however, can set the stage for boredom, distraction, fatigue, and depression – and frankly, not everyone can handle it. As a truck driver, spending large chunks of time alone is part of your job description. What can you do to stay effective, alert, and sane while you put in your hours behind the wheel? For starters, you can make having fun while driving alone a part of your regular routine. Obviously, there are certain limits to how truckers can entertain themselves while driving. After all, you’ll want to keep your attention on the road so that you can perform the task safely. In addition, you must respect the rules of the road and maintain your assigned schedule. Fortunately, that still leaves several possibilities for having fun while driving alone. Cranking up some tunes on the radio is a time-honored trick of drivers traveling in solitary splendor. Whether you sing along, tap out the beat on the steering wheel, or just enjoy the sound, playing music is a great way to entertain yourself and avoid loneliness and boredom. With MP3 players and satellite radio, gaining access to a playlist of your favorite songs has never been easier. To help fend off fatigue and boredom, switch up your musical selections. Alternating between styles and moods of music will help to keep your energy level up and your mind entertained. Reading while driving is a terrible idea, but it is possible to safely tick items off your reading wish list while on the road. Listening to audio books allows you to learn about something new, dig deeper into a hobby, solve a mystery with your favorite sleuth, or follow the adventures of your favorite hero, all without taking your eyes off the road. Choose from books on CD or browse the listings over at Audible, an app that allows you to download an amazing variety of audio books. Having fun while driving alone is simple if you can use the time to finally tackle a book on your to-read list. 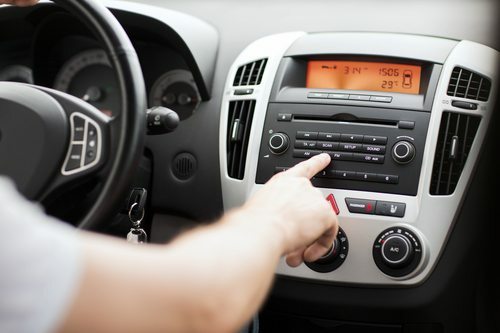 Podcasts are digital audio files that can be downloaded from the Internet to a mobile device of your choosing and played back while you’re driving. In many ways, they’re like radio chat shows. You can find podcasts about every topic under the sun, from the very broad (sports, politics, movies, fitness) to the very specific (Seinfeld, genealogy, puppetry, and even pens). There are also fiction podcasts, like the acclaimed Welcome to Night Vale. Whether you are looking for a good laugh, want to explore a new topic, or are simply eager to stay up to date with current events, you can find a podcast to accomplish your goal. To dip your toe into the medium, check out some of the most popular podcasts around, like This American Life, Radiolab, and Stuff You Should Know. Listening to your preferred podcasts is a great way to have fun while driving alone. Much like reading, writing is not an activity that you can normally indulge in while behind the wheel. However, advances in technology are offering a new, driver-friendly alternative in the form of speech-to-text apps that translate what you say to written words. With the right writing app, you can keep a journal that logs your thoughts, put together material for a blog about your adventures, or even write a book. The technology isn’t perfect, so you’ll probably need to do some serious revising before you share your writing with anyone, but speech-to-text apps certainly make it possible to write a rough draft without ever taking your hands off the wheel to put pen to paper. Research on memory indicates that challenging your brain is important for your health. Playing driving games provides the opportunity to get a mental workout and entertain yourself while driving alone. Search out the letters of the alphabet in road signs, see how many license plates from different states you can spot, choose an item to count, or make up a new game that’s all your own. The rules of the game aren’t important so long as it allows you to have fun without interfering with your driving capabilities. While talking on a handheld cellphone when you’re behind the wheel is illegal in many states, it’s generally acceptable to talk on the phone using a hands-free device. Chatting with friends and family back home allows you to nourish the important connections that enrich your life while also engaging your mind. Having fun while driving alone might be a bit of a challenge, but it is far from impossible. There are several strategies that you can utilize to ward off boredom and fatigue and keep yourself entertained while you’re in the driver’s seat.